Earlier this week, on a sunny afternoon, I strolled along Leoforos Vasilissis Olgas or Queen Olga Avenue in Thessaloniki, appreciating one after another the villas, some now decaying and crumbling, that once lined what had been the most elegant and one of richest areas of the city, and home of many ruling families at the late 19th century and the beginning of the 20th century. Wealthy Greek, Jewish, Turkish and European merchant and political built most of these architectural masterpieces. Several of them have been preserved after painful restoration efforts, including the Villa Mordoch, Villa Kapantzi and Villa Bianca. Others, unfortunately, are still waiting for a second chance after many decades, including the Salem Mansion at No 20. Each villa tells its own unique story. Some are galleries, others house cultural and historical institutions. Many retain their detailed colourful decorations, some even their impressive furniture, all influenced by the eclecticism of the 18th and 19th century. The Mehmet Kapantzi Villa at No 108, one of the most beautiful buildings in the city, was once owned by the Kapantzi family, whose had been in the city from the late 18th century. 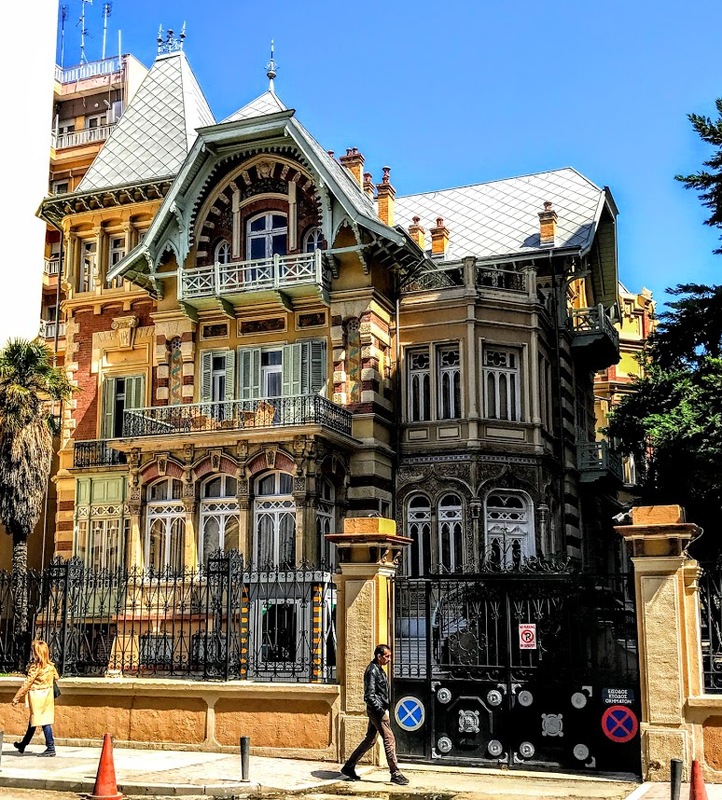 It was built in 1893-1895 for the banker Mehmet Kapantzi (1839-1924) on what was a seafront plot of 4,000 square metres, and at the time the west side was visible only from the sea. Mehmet Kapantzi was Mayor of Thessaloniki in 1908, and later Director of the Chamber of Commerce. His villa was lavish and the building cost more than 40,000 gold sovereigns, a mythical amount in those days. Essentially, this is two buildings, the main residence and the tower, linked to each other. Its architectural style displays Central European influences. The interior decoration was different in each room, the floors, doors and window were of different materials too – marble, parquet and wood; the double-flight staircase is of monumental character, and the ceilings were painted, apart from the central areas. Unfortunately, most of them were destroyed, but for some samples. When Thessaloniki was incorporated into the modern Greek state in 1912, the villa became the residence of Prince Nicholas, Military Governor of the city, and then from 1917 the home of the Prime Minister, Eleftherios Venizelos, as he headed a revolutionary government based in Thessaloniki. After the Greek defeat in Asia Minor in 1922, refugee families were accommodated in the villa until 1928, when it was acquired by the National Bank of Greece. Later, it was the headquarters of an American land reclamation company, a boys’ high school. 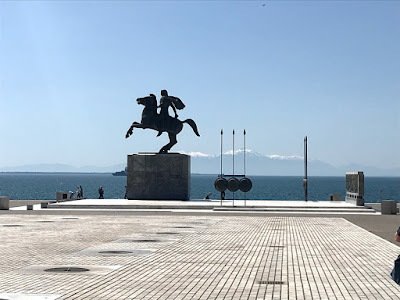 During World War II, it was requisitioned by the German authorities, and it was then British army headquarters in Thessaloniki. It then became a school once again until 1972. The building was abandoned and left in a dilapidated state until the National Bank of Greece agreed to restore the villa in 1982-1988 for cultural use. Today, it houses the Cultural Centre of the National Bank of Greece (MIET) and the Hellenic Literary and Historical Archive (ELIA) and it remains one of the finest surviving 19th century mansions in the city. Nearby, at No 105, the Ahmet Kapantzi Villa was also built in 1905-1907 for the Kapantzi family. It was designed for Mehmet Kapantzi’s younger brother, Ahmet Kapantzi, by the architect Pierro Arrigoni (1856-1940), who also designed the Villa Bianca. 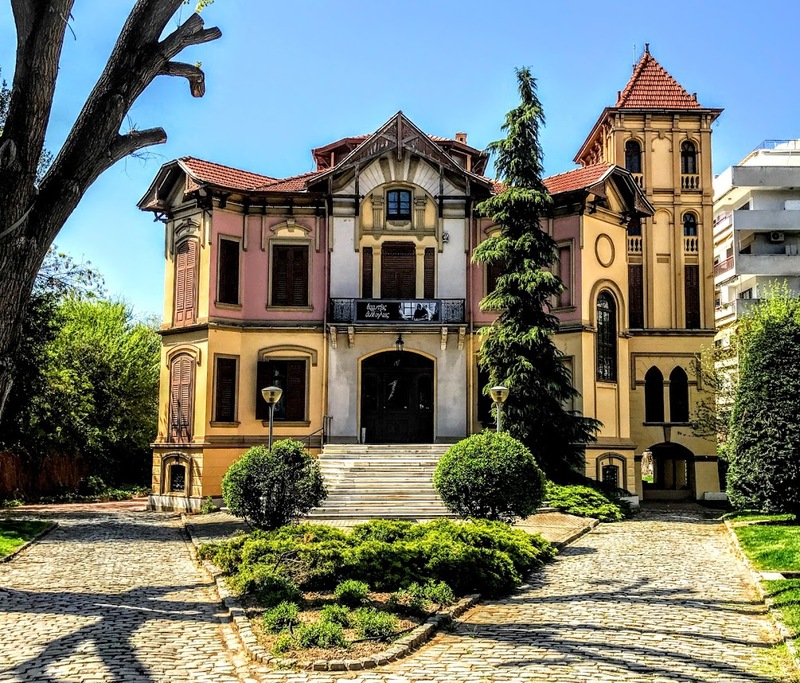 The Ahmet Kapantzi Villa combines the architectural styles of eclectism with neoclassical and renaissance elements, and also shows art nouveau, Arabic and Gothic influences. The interior frescoes included plants, birds, portraits and imaginary landscapes. This villa was acquired by the Greek State in 1926. It first housed the Red Cross, the Gestapo used it as its headquarters during the German occupation, and it was NATO headquarters in Greece after World War II until 1973. 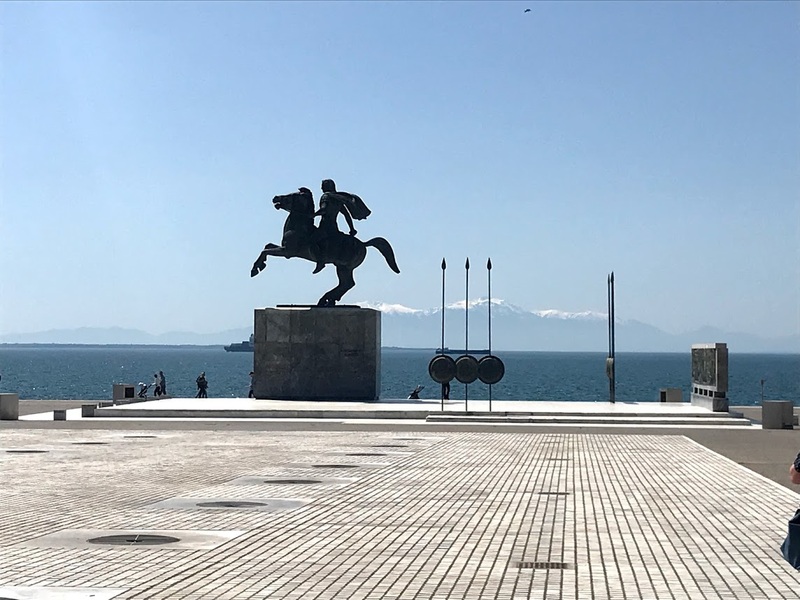 It was renovated after the 1978 earthquake and housed the planning committee when Thessaloniki was the European City of Culture in 1997. It was bought by a private businessman in 2012. The Dönmeh were Sabbatean Jews from Thessaloniki who publicly converted to Islam, but were said to have secretly held onto their Jewish beliefs and practices. They were descendants of Sephardic Jews expelled from Spain and Portugal during the Inquisition in the 16th and 17th centuries. The group can be traced back to the followers of Sabbatai Zevi (1626-1676), a 17th-century rabbi and kabbalist from Smyrna who arrived in Thessaloniki claiming to be the Messiah. He was soon leading one of the largest messianic movements ever, with followers across the Ottoman Empire and in Europe. In 1666, he was imprisoned and accused of sedition, but his followers continued to grow in numbers. After several months in prison, Zevi was brought before the Sultan in Adrianople and was offered three choices: to test his claims before a firing squad of archers, to be impaled, or to convert to Islam. To the horror of his followers, he converted to Islam in 1666; in return, he received honours and a generous allowance from the Sultan Mehmed IV. Most of his followers abandoned him, but about 300 families joined him in becoming a Muslim. After his conversion, Zevi continued to preach many of his old beliefs, and a new Kabbalist culture, slightly influenced by Sufism was born. After Zevi's conversion, the Jews of Thessaloniki who followed him into Islam became the Dönmeh. The Turkish word dönme is from the root dön- that means to turn, to convert or to betray and was used in a pejorative way. They are also called Selânikli or ‘people from Thessaloniki,’ or avdetî (religious convert), but they call themselves simply ha-Ma’aminim, a Hebrew name meaning ‘the Believers.’ They also call themselves sazanikos, the Turkish for carp, because of the way that fish changes its outward appearance – or because of a prophecy that Sabbatai Zevi would deliver the Jews under the zodiac sign of the fish. Despite their conversion to Islam, the Dönmeh secretly remained close to Judaism and continued to practice Jewish rituals covertly. They recognised Sabbatai Zevi as the Messiah, observed many Jewish mitzvot or commandments, and prayed in Hebrew and later in Ladino. They also observed rituals celebrating events in Zevi’s life and interpreted his conversion to Islam in a Kabbalistic way. Other practices sought to avoid marriage with either Jews or Muslims, but the Dönmeh often maintained links with other Sabbateans who had not converted to Islam and even with Jewish rabbis who secretly settled disputes within the Dönmeh concerning Jewish law. The Dönmeh followed both Jewish and Muslim rituals, sometimes shifting between one and the other as necessary for integration into Ottoman society. Outwardly, they were Muslims, but secretly they were Jewish Sabbateans, observing traditional Muslim holidays like Ramadan but also keeping the Jewish Sabbath, brit milah or male circumcision at eight days, and major holidays. Dönmeh ritual was often a combination of elements of Kabbalah, Sabbateanism, Jewish traditional law, and Sufism. The Dönmeh built their own mosque, and their liturgy evolved as their sects grew and spread. At first, much of the Dönmeh literature was written in Hebrew. Later, Ladino replaced Hebrew as the prominent language and became both the vernacular language and the liturgical language. Several Dönmeh groups, sects or branches emerged. The İzmirlis were formed in İzmir or Smyrna, and were mainly doctors, engineers, professionals and members of the merchants classes and intelligentsia in Thessaloniki. The Jakubis, who were educated and wealthy, were founded by Jacob Querido (1650-1690), the brother of Zevi’s last wife. Querido claimed to be Zevi’s reincarnation and a messiah in his own right. The third group, the Karakashi or Konyosos branch, were the most numerous and strictest branch of the Dönmeh and included the artisan classes. Other Dönmeh groups in Thessaloniki included the Kapantzi, who questioned later claimants to Zevi’s succession, and the Lechli, who were of Polish descent. Each branch had its own prayer community, organised in a Kahal or congregation. An extensive internal economic network provided support for lower class Dönmeh in spite of ideological differences between branches. All these groups believed that Zevi was the divine messiah and that he had revealed the true ‘spiritual Torah,’ superior to the practical earthly Torah. They created holidays celebrating events in Zevi's life and their own history of conversion. The Terakkî schools were founded by the brothers Mehmet and Ahmet Kapantzi in 1887 for girls and boys in the Dönmeh community in Thessaloniki. By the early 20th century, the Dönmeh numbered no more than 15,000 and were mainly found in the army, government, and business. Several Dönmeh were also among the leading members of the Young Turks, who brought down the Ottoman Empire. During the ‘population exchanges’ between Greece and Turkey in 1923, some Dönmeh in Thessaloniki sought recognition as non-Muslims to avoid being forced to leave. After they were deported, their former mosque, Yeni Djami, housed Greek refugees from Turkey, and is now used by the city as a venue for cultural events. No gravestones from their cemeteries survive in Thessaloniki. In Turkey today, the Dönmeh probably number only 2,000 people who live in Istanbul and Izmir and who still believe that Sabbatai Zevi will yet return to redeem Israel. Some preserve Jewish customs, such as celebrating festivals, studying the Zohar, and even reciting portions of the Psalms each day. They also continue to follow the ‘18 Commandments’ handed down by Shabtai Zevi, including the absolute prohibition on intermarriage. Their past identity continues to haunt them within Turkish society, and the term Dönme remains one of opprobrium. The word Dönmeh is used in Turkey today to refer not only to ‘untrustworthy converts’ to Islam from Judaism but it is also a derogatory word for a transvestite or anyone claiming to be someone they are not. Turkish identity is often defined along lines of ethnic descent and Sunni Islam, and this community is still viewed with suspicion by Turkish Muslims and shunned too by Turkey’s Jewish community, although many still cling to their Jewish heritage.